Flowers have to earn their place in my garden. For a long time my theory was that if I ignored a new plant for two years and it stayed alive it was a keeper. (That's asking a lot considering how hot and dry East Texas summers are.) Now that the nest is just about empty I have a little more time to pamper green things but I'm still a big fan of anything that blooms even when I forget it's there. 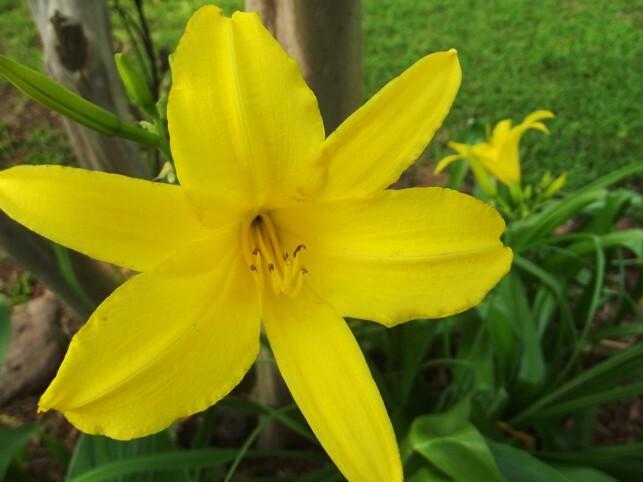 One of my favorites is the daylily. We've had a steady stream of color since spring...a beautiful show this year. I like native varieties (nothing fancy), since they blend in well with the woodsy theme we have going around here. 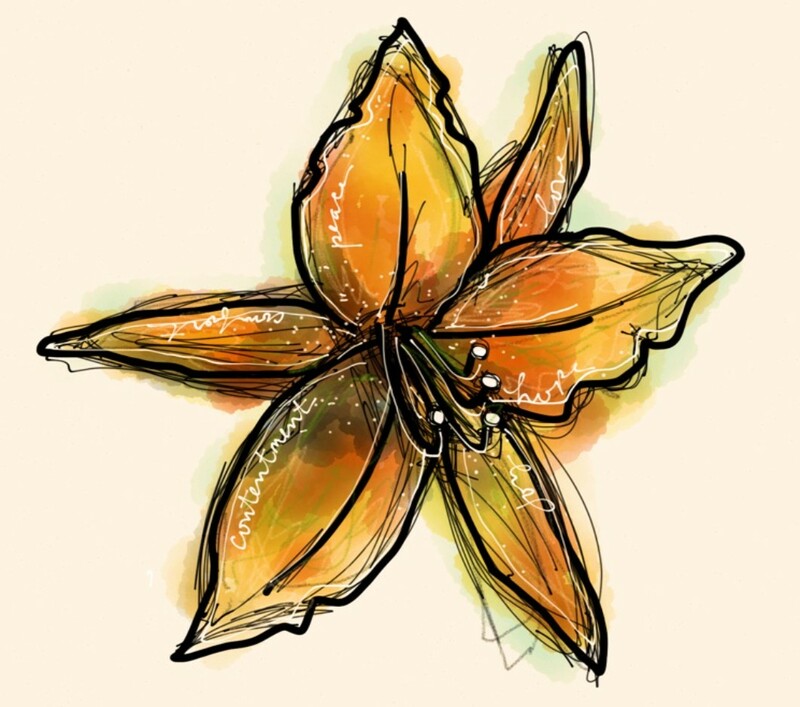 All this lily loveliness has inspired lots of sketches lately, including this one, created in Paper 53. I lined in the basic form quickly from life and finished the rest in the studio. The idea for the little words on the petals came from a friend who follows my page on Facebook. She thought she saw words in some of the details of a different lily I sketched in this post last spring. Thanks, Karen for the inspiration! It is such great fun exploring all the drawing apps out there. (The huz gave me an IPad recently and I haven't come up for air since!) Paper 53 is one of my favorites so far. It's so easy to create clean lines and the watercolor brush is a fun way to splash a little color around. By far, though, my favorite feature of this app is the paint mixer. It is ridiculously fun to use! I also love the fact that I can do a little digital sketching here and there without a lot of set-up or clean-up. Sketching more = improved skills and confidence and I definitely see these things making their way into my work on paper and canvas. Do you sketch much on your computer? Does it improve or otherwise change the way you work with paint? I'd love to know what apps or programs you find useful or inspiring. Love your beautiful flower! Bold and full of life! 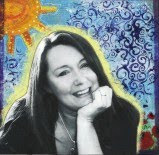 I really love your artwork inspired by your day-lilies! Especially that lovely white text to contrast the image! I love how this piece turned out. I am much better sketching digitally! I love that mistakes can be easily remedied!!! I love doing digital art it's a bit more freeing for me....however I love mushing about with color too!! It depends what mood I'm in to which style I turn to!! Your flowers are beautiful. The photos and your art. Great art. what a gorgeous illustration of a lily-really beautiful-love the words! 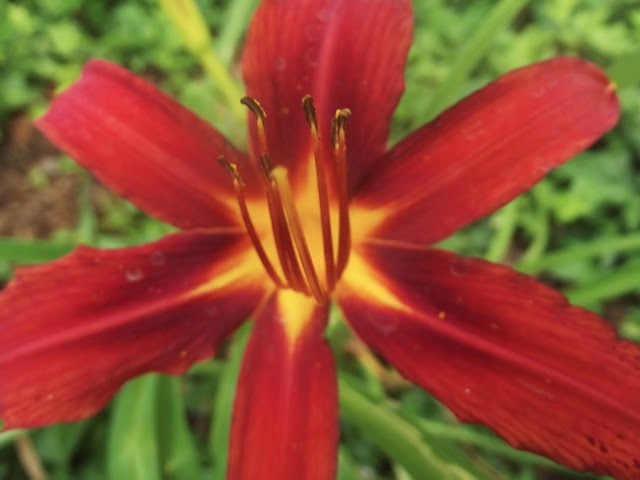 Beautiful daylily! I love how the black and the white pen work really make it pop. HPPF! Love your photos and sketch! So beautiful! !